It’s your story—write an extraordinary one! 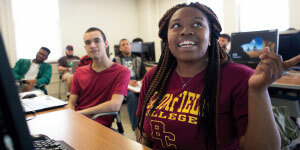 Ready to experience Bloomfield College for yourself? 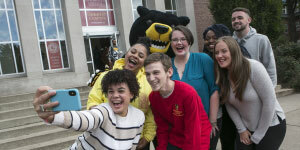 Explore our innovative programs and choice of majors at bloomfield.edu/academics. Learn more at our admission events held throughout the year or on our campus at your convenience. Sign up for a visit at bloomfield.edu/events. A college should be measured by its ability to improve the lives of its students. Whether your goals are to enhance your economic standing, gain valuable experiences, find your place in the world, or any other worthwhile aspiration, you should be completely supported in your pursuits. You are smart and motivated, but you will still need help achieving your goals. 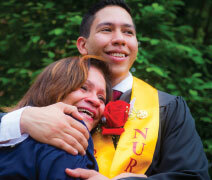 Bloomfield College has helped lift thousands of students just like you toward their academic and personal goals. Nationally, Bloomfield College ranks 20th for helping students from low-income families enter the middle and upper class. In our home state of New Jersey, we hold the highest success rate among all liberal arts colleges and universities in moving students forward in economic standing. We make reaching your dreams financially possible too. Bloomfield College proudly offers the lowest full-time tuition rate for any private four-year college or university in New Jersey. Many students attend our small private college for the same or below the direct cost of a public institution, as 95% of our students receive financial aid. We are also committed to cost transparency, having eliminated comprehensive and course fees. That means families know the cost of attendance up front, with no hidden expenses. More than half of our students identify themselves as first generation and are the first in their families to enroll in college. U.S. News & World Report has ranked Bloomfield College the 15th-most diverse national liberal arts college in the United States. The size of our residential student population has doubled since 2003, and we have recently built two new state-of-the-art residential halls to keep up with the demand. We are located in historic Bloomfield, New Jersey, just 15 miles from New York City, a cultural epicenter for entertainment, business, and internship and career opportunities. Eleven NJ Transit lines stop within walking distance of our vibrant campus, making for an easy commute to and from the College. Bloomfield College is test optional, which means you won’t have to submit SAT or ACT scores to be considered. * We’ve found that high school GPA has been a more reliable predictor of student success on campus than standardized test scores alone. According to the National Center for Fair and Open Testing, institutions that have adopted a test-optional policy experienced an increase in applicants that are more diverse and demonstrate higher academic quality. * Find out more at bloomfield.edu/testoptional. Our highly respected Frances M. McLaughlin Division of Nursing boasts a 94% licensure exam pass rate. Our Computer Science and Network Engineering programs report 70% of their graduates are employed in their fields of study upon graduation. Bloomfield College students also have the cutting edge of innovation within creative arts and technology at their fingertips thanks to our new Center for Technology + Creativity. Such advanced training will have you prepared for a shining career. Discover what makes Bloomfield College the best place for deserving and motivated students to begin writing their own stories. Start your next chapter. Apply to Bloomfield College today!